- D 92380 : "The Guardians of the Lost Library", from 1993, by Don Rosa (by name only). Elizabeth Tudor was born on September 7, 1533, daughter of Henry VIII and his second wife, Anne Boleyn, at Greenwich Palace, London, England. As a child, she received the rigorous education normally reserved for male heirs. Her situation was precarious during the reigns of her brother Edward VI and her half sister Mary I. After the Wyatt rebellion of 1554, she was imprisoned for treason but later released. On November 17, 1558, on Mary's death, she acceeded to the throne and was greeted with public jubilation, becoming Queen Elizabeth I, sometimes nicknamed "Good Queen Bess", and she was crowned Queen on January 15, 1559. She assembled a core of experienced advisers, but zealously retained her power to make final decisions. Important events of her reign included the restoration of England to Protestantism, the execution of Mary, Queen of Scots, and England's defeat of the Spanish Armada. She lived under constant threat of conspiracies by British Catholics. She was known as the Virgin Queen, wedded to her kingdom, as she never married. Many important suitors came forward, and she showed signs of romantic attachment to the earl of Leicester, but she remained single, perhaps because she was unwilling to compromise her power. 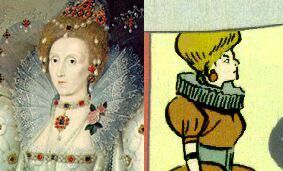 She had another suitor, the earl of Essex, executed in 1601 for treason. Though her later years saw an economic decline and disastrous military efforts to subdue the Irish, her reign had already seen England's emergence as a world power and her presence had helped unify the nation against foreign enemies (her reign is often called the Golden Age of England). She died in Richmond Palace on March 24, 1603 and was succeeded by James I, son of Mary Queen of Scots and her second husband, Elizabeth's cousin Lord Darnley. First, in "The Ghost of the Grotto", it is said that a long time ago, there was a ship sailing to England, carrying Spanish gold for Good Queen Bess, which crashed against the Carribbean reeves. The only survivor, the captain, hid in a cave with the treasure, wainting for Sir Francis Drake. But he didn't come, and when the now old captain thought he wouldn't be able to protect the treasure anymore, he kidnapped a little boy so that he can protect it. This way, every 50 years, the same day, the protector of the treasure was changed , which created a great fear into town. In 1947 (the date of this story), the actual guardian, who thinks Drake is still alive, has to choose his successor and kidnaps Dewey Duck, who is eventually saved by Donald and his brothers. Then, in "Back To Long Ago! ", Scrooge and Donald learn that their past incarnations, Matei McDuck and Pintail Duck, were sailors of Good Queen Bess and that they had hidden a treasure chest on a desert island. In "The Wax Museum", a wax statue of Elizabeth can be seen. In "His Majesty, McDuck", we learn thanks to an engraved copper plate found by Scrooge that the land Nova Albion, discovered by Sir Francis Drake on June 17, 1579, in name of Queen Elizabeth of England, is in fact located in Calisota, and that Drake founded here, on a hill (later known as Killmule Hill, and later as Killmotor Hill), his settlement, Drake Borough. In 1818, it is renamed Duckburg by Cornelius Coot.